Minneapolis rockers Big White House celebrate their 25th Anniversary. In a time where many bands struggle to stay together, members Paul Pirner (vox/guitar), Martin Sundquist (guitar), Brian Guze (bass), and Brad Fayfield (drums), keep Big White House going strong, even after over two decades. Local artists Dosh and Greg Cardinal will start the night's festivities. The World’s Most Dangerous Brunch is a new, monthly brunch series that features music from the World’s Most Dangerous Polka Band, Polish brunch items on special, and sausages from Minneapolis landmark Kramarczuk’s. 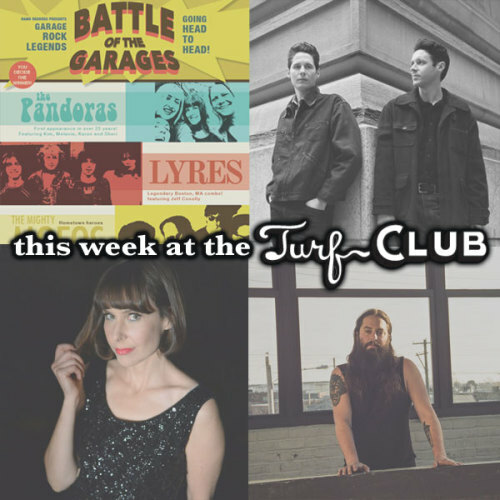 “The World’s Most Dangerous Polka Band at the Turf Club is a perfect fit,” says General Manager Nate Kranz. “We’ve both been popular longer than most of our fans have been alive, and we felt like with Nye’s impending closing we had to make sure this iconic group has a new home.” The World’s Most Dangerous Brunch takes place the last Sunday of each month through the end of 2015. Ringo Deathstarr, a musical trio from Austin, TX, have been putting out records since 2007. Consisting of Elliott Frazier (guitar, vocals), Alex Gehring (bass, vocals), and Daniel Coborn (drums, vocals), their sound is born from a love of melody, a love of guitar, and a hatred of pompous vocals. Finding it to be too much fun, the group has expounded upon the sounds of the masters before them. This desire to play the music they were too young to witness as children has taken Ringo Deathstarr around the globe. Warm guitars and pulsing drums combine to form an aggressively atmospheric bubble, encompassing the listener in an infectious cohesive which blends the sounds of an era when Sonic Youth and Jesus and Mary Chain walked the Earth with a forward thinking and creatively stubborn indie darling.